Happy Hour is here! 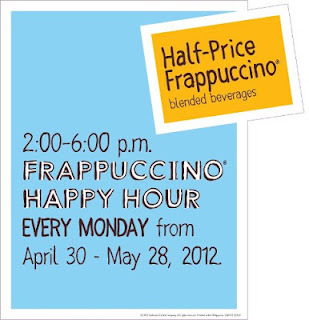 Every Monday starting April 30 to May 28 @ 2-6pm enjoy your favorite Starbucks's Frappuccino at half the price! What's more this is nationwide! Everyone across the country can enjoy the Happy Hour and no one will be left out. Isn't that great? A couple of days back, I've seen blogs from US and Malaysia announcing their Starbucks' Happy Hour treat. Finally, it has arrived in the Philippines and the fun begins tomorrow! 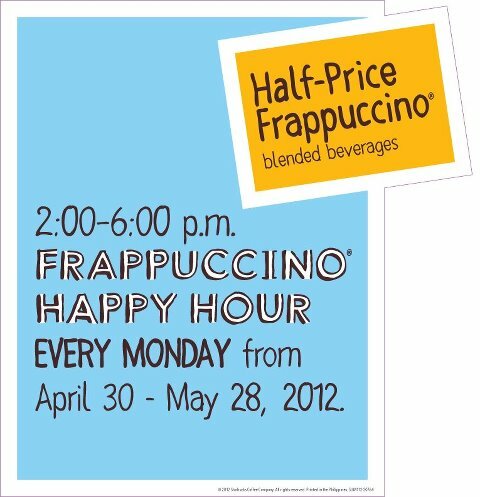 Good thing I took a half-day leave tomorrow, I'll ask my sister to treat me a Caramel Frappuccino. Yum! It makes me wonder how one individual prepares himself/herself before going under the knife. With the latest technologies in health and cosmetic/plastic arena, one can think that it's possible to achieve the enhancements you've ever dreamed anytime so as long as you are capable to spend. So before jumping into a surgeon office one must do a research on a specific procedure they are interested in. Not everyone is a qualified candidate and one must anticipate rejections especially if there's a serious health condition that can trigger another condition. Take for example the restylane for wrinkles. I didn't know such procedure existed. All I know is that when it comes to hiding your true age, Botox is the way to get it. Interesting fact that I read is that Restylane can add skin moisture thus the youthful glow. I wonder if I'm a qualified candidate for this procedure. For obvious reasons, pregnant and breastfeeding individuals are marked off the list. General qualification is an adult with good health so I assume that a person's vital health information and medical history is needed before getting a go signal. As far as I know I'm healthy and the only serious medical condition that I had is when I was in grade school. What's more Restylane has less risk of allergic reactions since it contains components that are found in our body. Cool! Now that I mentioned Botox, it surprises me that some celebrities who undergo this procedure will immediately come out of the television or had media exposure creating a stir and letting the world know that they had facial enhancements. I'm curious than ever to find out how long is the botox healing time. I'm surprised that after the injection, you can return back to your normal activities. Wow! So that's why they come out just like that even if their face is slightly puffed. Interesting fact is that a patient needs to refrain from lying down or rubbing the face to avoid the spreading of Botox to other parts of the body. Makes sense to me. The sacrifices you need to make to be beautiful. Another find in looking young is the Juvederm injections which is another new term for me. What caught my attention was that ages 30-65 can undergo the juvederm under eyes. My initial reaction was this procedure is mainly for treating dark under eyes but upon researching it on My Surgery MD, I was wrong with my assumption. See? I have a lot to learn in all these cosmetic surgical terms. Juvederm is a popular treatment to smoothened facial wrinkles and fine lines. I think I would need this kind of treatment in the next 5 years. I've been noticing since my late twenties that there are some lines visible under my eyes and for the time being, my remedy to prevent it for being too visible is to moisture my face. I'm starting to like this procedure especially that it's non-invasive treatment and the side effects are minor versus Botox. I think Juvederm and Restylane are on the same level of cosmetic procedure that is a low risk but of course one person's medical background if you're a perfect candidate. After all being said on this entry, the bottom line is to know your surgery well and do your homework. No need to rush and jump the bandwagon of people who undergo enhancements. Listen to your body and asked yourself if you're ready. I initially joined Nestle Club to learn new recipes. Hubby and I were enjoying our time alone in our humble apartment that we are renting in Makati back then. Every weekend, I always make it a point to cook. But now since we are living with my family, my mom and dad are the official cooks of the house. Hehehehe. Anyways, being a member in Nestle Club means getting the latest news and promos and for this summer they are giving away a trip for four to Hong Kong, Singapore, or Malaysia! Cool! I so wanted to travel to other countries. I'll probably choose HK or SG since I'll be visiting my sister soon in KL this August. Promo runs from March 1 to May 31, 2012 only, so start sending in as many entries as you can. Visit us athttp://apps.facebook.com/nescafesummerpicks/. Enjoy your summer! I was surprised to see that these rights (rules) exist. 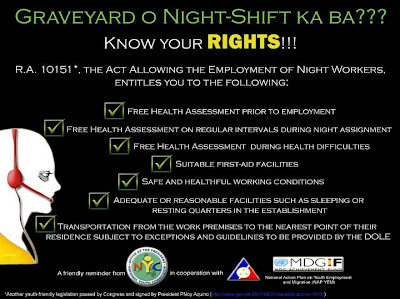 Back then when I was a call center agent for almost three years (2003-2006) all I know is that when you are working at night it's mandatory to have a night differential. 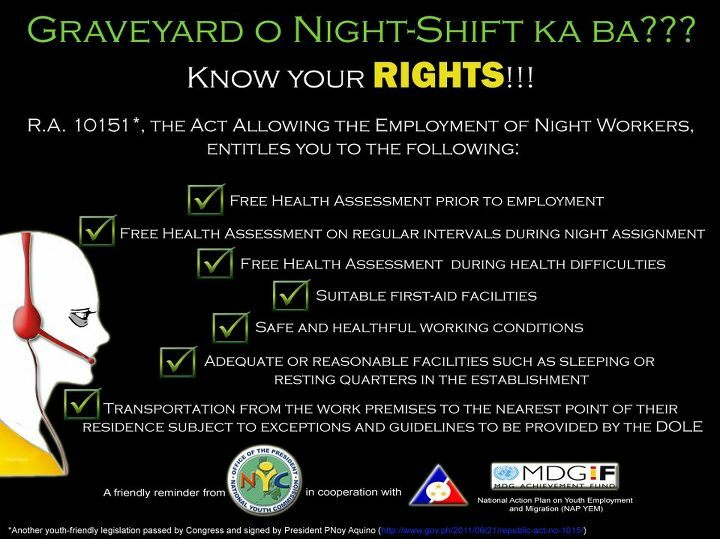 In fairness to the company, they provided us sleeping quarters while I heard some companies don't have any (most of the time these are IT consulting/ staffing/ augmentation companies that needs to have employees working at night to support other countries). Having said that these are laws created by the government, I wonder how well the companies here in the Philippines (especially BPO and RPO companies) are aware about this. Let's face it, not all of them have sleeping quarters. Not all of them have a clinic or "first-aid" facility (yeah, experienced working in one company who doesn't have these). So the question will be, how well is these laws implemented here? How strict our government can do for these rules to be followed by the outsource companies? In celebration of Holy Week, I would like to share this info especially to those who are making rounds around the metro or provinces to visit churches. It was shared by a member in a N@W yahoogroup. Like the other members in the group, I'm interested to visit the relic in Poor Clare Monastery (Quezon City) but I'm not sure if there will be buses or jeepneys available today or tomorrow. Most likely me and my husband will take a chance on Sunday. Hopefully there will be no traffic and there are PUV (Public Utility Vehicles) available on that day. February 27 (PIA) -- The relic of St. Clare of Assisi is now in the Philippines to visit different churches and monasteries in the country. According to the Catholic Bishops’ Conference of the Philippines (CBCP), the visit is part of the propagation of the devotion to the patron saint of navigators, those who want to have children, of life and of families. The CBCP added that Philippine Ambassador to the Holy See, Mercedes A. Tuason was able to secure permission from the Federation of Poor Clares based in Foligno in Italy that owns the relic, as well as from ecclesiastical authorities of the city of Foligno and the Vatican, through the Congregation of the Causes of the Saints to let the relic of St. Clare visit the Philippines. For the first time in 800 years, the relic of St. Clare will be on a pilgrimage outside Italy. Father Jess Dajac, a Filipino priest based in Rome, has been appointed as official guardian of the relic while in the Philippines. 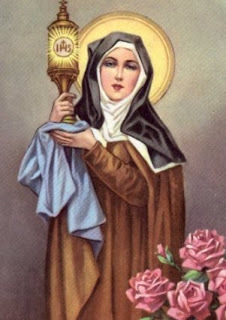 St. Clare was born from a wealthy family in Assisi, Italy on July 16, 1194. She entered the convent on March 20, 1212, leaving all the worldly inheritance that she could have received from her parents. Update: As of yesterday (April 5) the relic of St. Clare was transferred to another church/monastery/convent. It will be back in Poor Monastery of St.Clare in Quezon City from April 24-30. On that case, me and hubby will visit the relic on the 29th instead.